Inspired by a genuine desire to properly acknowledge and honour the mentors and minions who do the most to enable Aussie Coal Diggers’ uniquely entitled ‘way of life’, as well as to warn ordinary citizens of grave dangers to safety and security from extremist-alarmist-elitist-warmists, inner city avocado people and Solar Panelista Revolutionaries, Digging Deeper: Secrets of the Neo-COALonial Movement Unearthed! was a deliciously stunning interactive production like none other ever seen! Starring Coal Diggers Coral Bleach, Hazel Wood and their Attorney/Greenhouse Mafia ‘fixer & agent’ Lignite Pitt QC from the Billionaires United Mining Services (aka BUMS, as themselves), there was no confusing the inescapable message: Coal Diggers and their ‘People’ are under threat; suffering from gross discrimination, widespread oppression and abuse at the hands of those who have had far too many lattes and chardys to understand how vital fossilgarchs’ ‘rich Aussie coalture’ is to meeting the needs of those that do the heavy lifting and trickling to keep the neo-economy afloat. 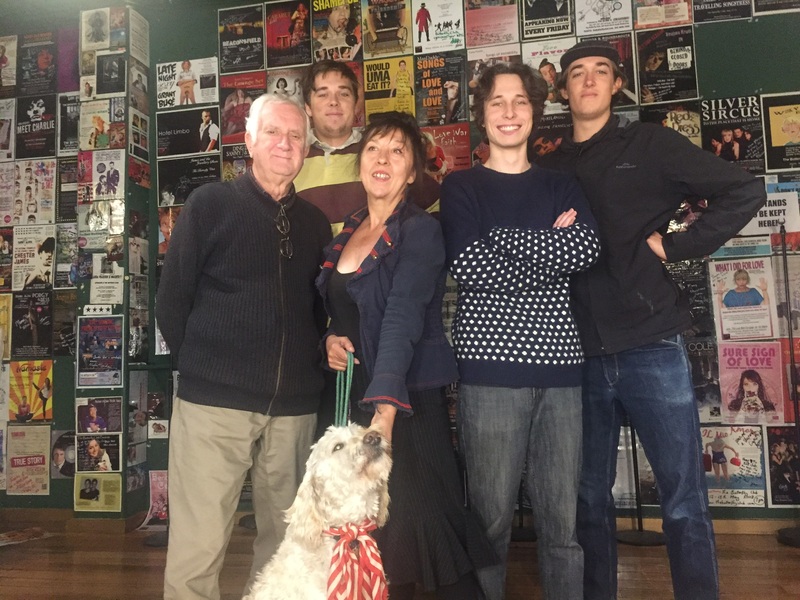 Led by Susan Bamford Caleo’s exquisite vocals—superbly mixed by Kevin Gaynor in his state of the art recording studio- rapturous Melbourne audiences sung along to favourite Coal Digger tunes including Tony, Like a Rich Coal Baron, Stand By Your Mine, You’re So Greeat, Ra Ra Ra Putin!, and Addicted to Coal. 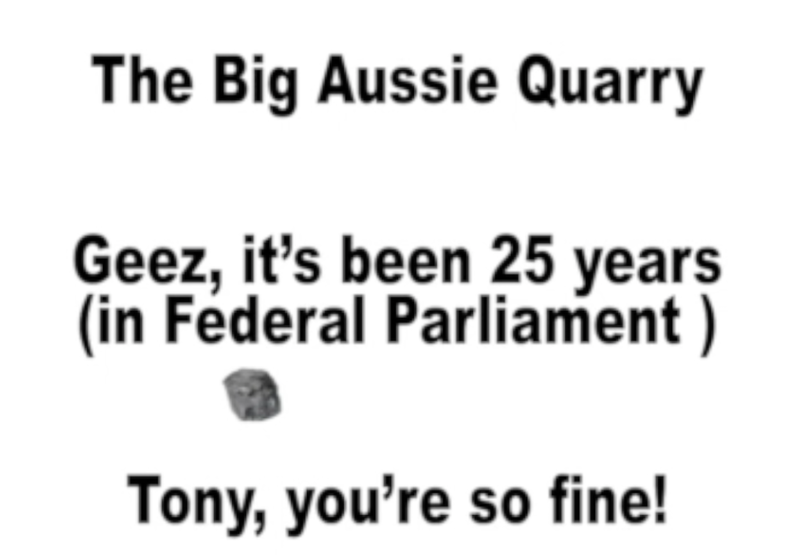 The show’s stunning karaoke visuals—featuring ‘Rocky’, an adorable bouncing lump of coal that would have made ScoMo and his COALition colleagues proud—were created by animation guru Richard Hart, ensuring that no one missed a word of the beloved odes to coal. Meanwhile, under the skilful direction of Coal Digger dancer and doyen Hazel Wood, using canes, shovels and mirrored guitars, the show’s choreography’s was purely delightful. 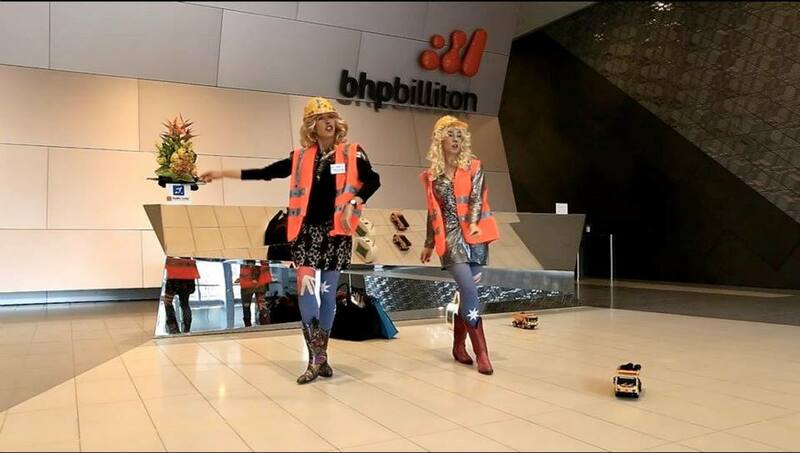 Expect Coal Diggers dazzling dance moves to go viral! Clever and ideally paced dialogue woven through galloping sets of coal (and substrata fossils generally) worshipping poetic interpretations of classic tunes shone a light on the unsung heroes and heroines of the coal industry. 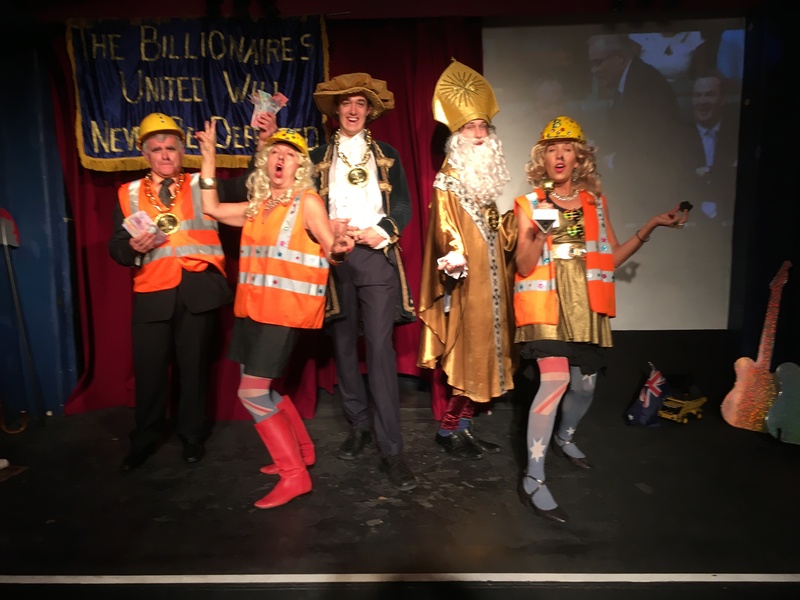 As informative as it was entertaining, Digging Deeper directly honoured a blend of local and global Big Name Fossilgarchs and friends—such including Gina Rinehart, Clive Palmer, Tony Abbott, Trump, and Putin—with big singing voice serenades. And so too were some of BUMS not so well known minions. Due credit was given to the Coal Diggers’ pet billionaire charity the Institute of Public Affairs—for having so discreetly and relentlessly advanced billionaire fossilgarchs’ interests for more than 75 years. And now even more Melbournians are aware that Ruppie’s Daddy (Keith Murdoch) was a key founder of the IPA, which it must be said is doing the most terrific job at progressing Fossilgarchs’ long-game campaign to dumb down and privatise the ABC. And for his strategically masterful ‘political appointments’, thanks and praise was also given to Australia’s Minister for Arts & Communications, Senator Mitch Fifield (also an IPA boy since forever). For instance, Coal Diggers are still combusting over ex Rio Tinto boss Sam Walsh becoming the new Chair of the Australia Council, which controls federal arts funding. 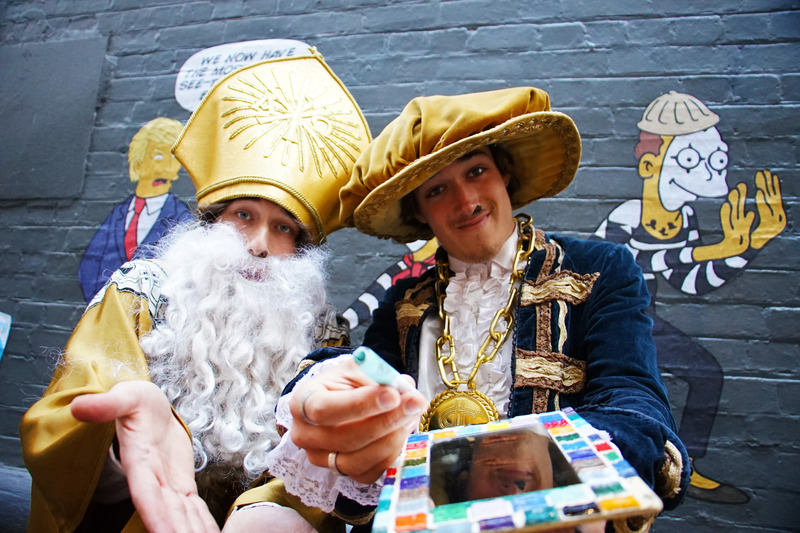 Not only does this help put all those nosey pokey artists back in the dark ages where they belong, it clearly shows that serious allegations raised in international bribery scandal investigations are no obstacle for powerful fossil diggers attaining high level roles in Australia’s leading arts & culture institutions. And on one occasion a groupie in the audience called out Our Minister Fifield’s ingeniousness for having bypassed those pesky democratic selection panels in order to appoint the Chair of the Minerals Council, Vanessa Guthrie to the ABC’s board! Again, Melbournians were visibly impressed to know that for influential Fossil Diggers with very deep pockets, there’s no need for any qualifications in any of the areas relating to Australia’s public broadcaster’s charter. 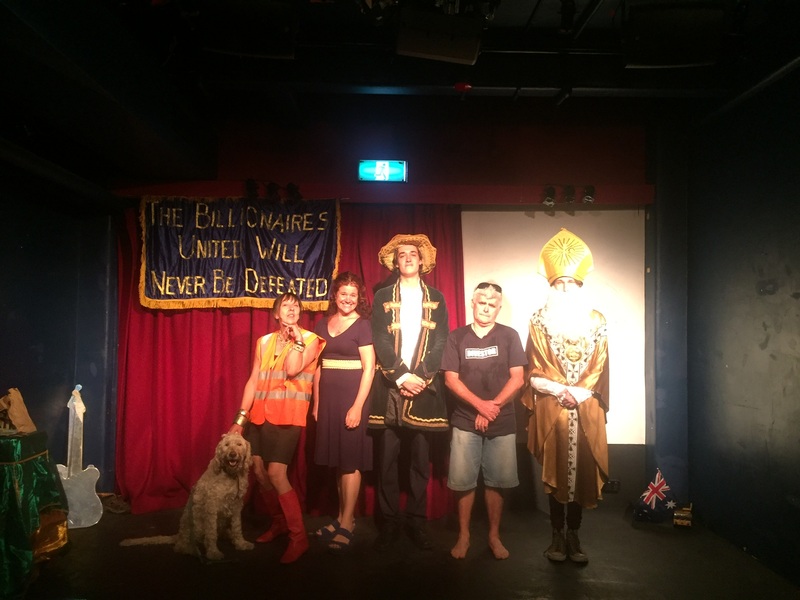 Thanks to remarkable revelations from BUMS’ special guests, leading international experts Professor Lord Gaseous Mockington (highly qualified Medieval Geographer from the Frackers Guild of the Universitarse of Climatastrapharse (est 1235 AD), and Pentecostal Minister Sergei Carbonacious III (director to the director of Russia’s Ministry for Truth and Facts) Melbournians (and we’re told some tourists from Queensland) no longer have any doubts as to whose in rightful control of the information and truth technologies they need to trust. Audience appreciation was audible as remarkable insights into global corridors of power revealed how fossilgarch aligned media, digital platforms, and surveillance are standing strong against aggressive green-left biased communist ‘fake news’ assaults on the traditional truth & facts Coal Diggers most need to maintain western values, and ensure safety and security, particularly in extremely dangerous places around the world where valuable fossils lie waiting to be liberated by BUMS and friends. 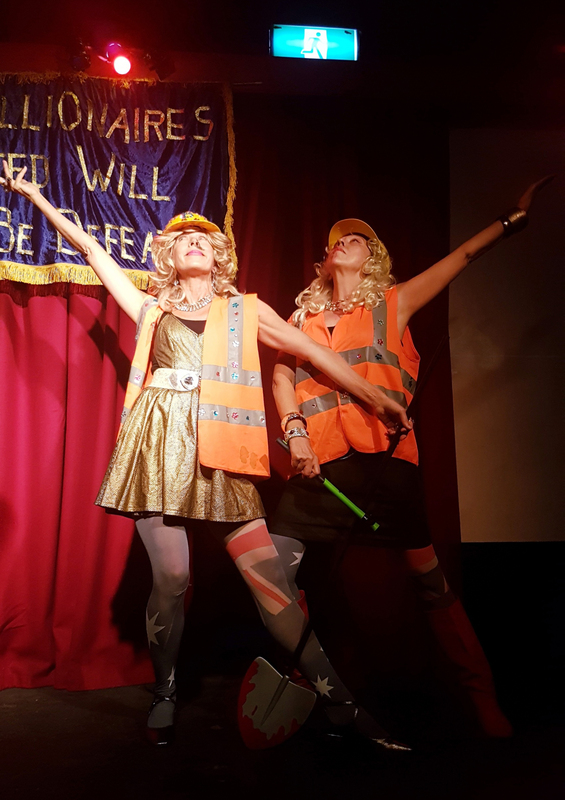 As they have since their creation in 2013 in the lead up to Tony Abbott’s reign over Australia, the Coal Diggers’ psychedelic-disco inspired costumes with signature bright sparkly hard hats and high vis delighted all at The Butterfly Club. Always awash with colour and movement, the stage felt truly alive as the Coal Diggers shimmied away under the ‘Billionaires United Will Never Be Defeated’ banner, which itself was a direct take-off of a stunning Deborah Kelly artwork, and handmade by Liz Conor whose fine sensibility could be seen right through the Coal Diggers costumes as well. 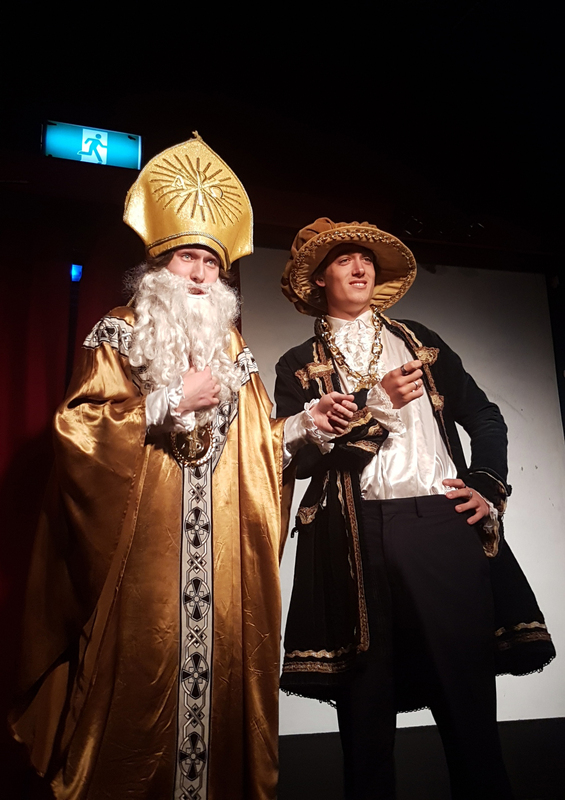 Thanks to the marvellous Rose Chong Costumiers, BUMS Special Guests Professor Lord Gaseous Mockington and Pentecostal Minister Sergei Carbonacious III looked just like the timeless, traditionalised leading experts they no doubt were. 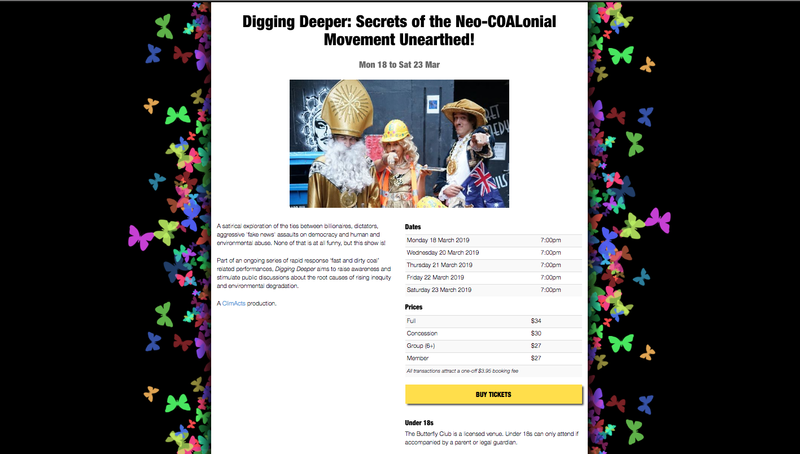 In short, there has never been a coal karaoke cabaret that could rival the superb movement, mood, poetry, dance work, visuals and all around inspiration of Digging Deeper: Secrets of the NeoCOALonial Movement Unearthed! Even without threats of gulag from Minister Sergei for those who failed to stand and sing the Australian anthem: Advance Australian Coal, we’re sure Melbourians would have ended every performance with a standing ovation! Or perhaps that was in reaction to Hazel Wood announcing her challenge to BUMS’ nemesis BAD ADAM Bandt for the seat of Melbourne on the grounds that his highly discriminatory ongoing proposals to limit billionaires’ creative trickling proves he has been captured by extremist-alarmist-elitist-warmists, inner city avocado people and Solar Panelista Revolutionaries! Either way—as federal election frenzy takes hold—expect to hear more about Ms Wood’s impressive campaign platform demanding all people cease and desist from saying mean things about coal (and fossils generally). This brilliant review was written by Coral Bleach, whose sense of responsibility for the industry during these rocky times brought a sense of duty to not only write, direct, produce, and finance Digger Deeper but to also write this critical review. 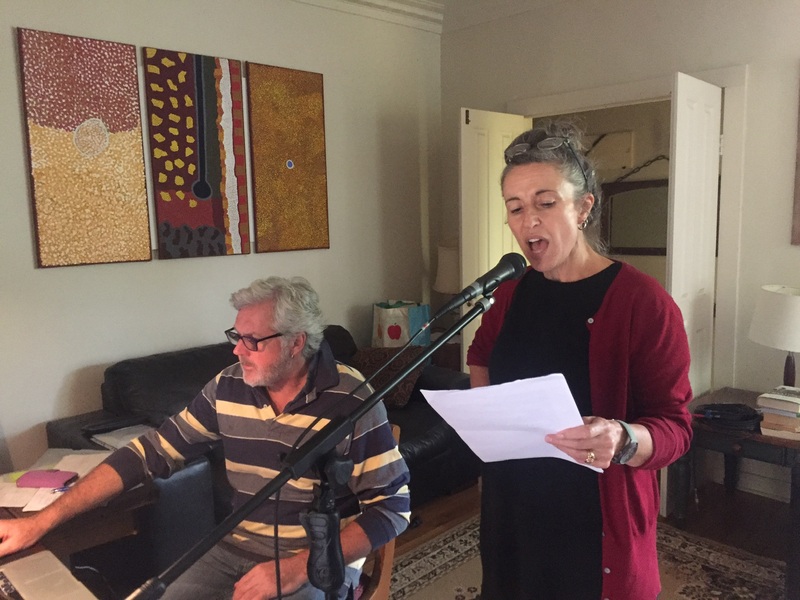 Digging Deeper’s script and coal karaoke lyrics were written by Deborah Hart, who gratefully acknowledges contributions from Digging Deeper’s team, as well as Liz Conor and Zelda Grimshaw for their historical contributions to the Coal Diggers act. Artistic inspiration: The John Howard Ladies Auxiliary Fan Club (aka The JoHos) co-created by Liz Conor and Zelda Grimshaw, Twiggy Palmcock, and the founders of Victoria’s Quit Coal Collective. On a final serious note, Digging Deeper was a satirical exploration of the ties between billionaires, dictators, aggressive ‘fake news’ assaults on democracy and human and environmental abuse. 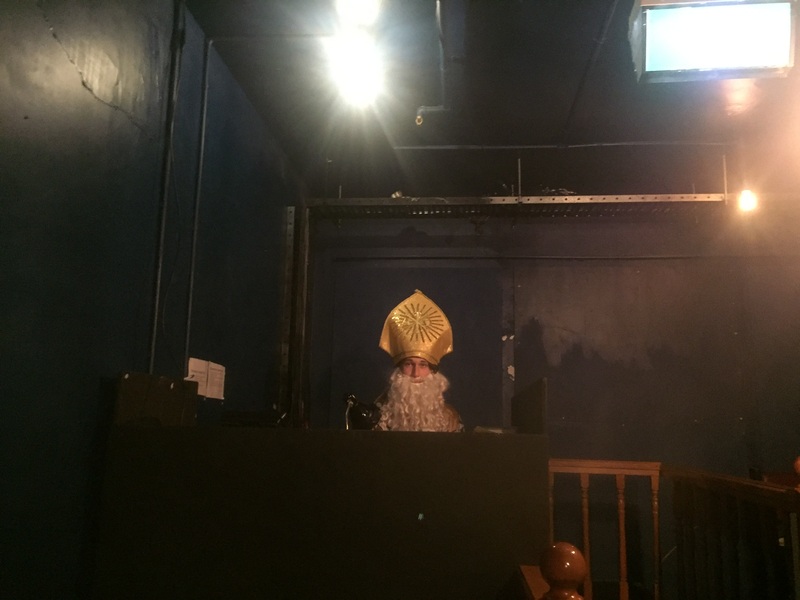 Part of an ongoing series of rapid response ‘fast and dirty coal’ related performances, Digging Deeper’s aim was to raise awareness and stimulate public discussions about the root causes of unacceptable and rising inequity and dangerous environmental degradation.